"I have to go out and each time it's like this." Awww yes, the film Savini begrudgingly admits to working on. My history with this particular film is rather short and uninteresting. I remember seeing a few bloody stills in Fangoria as a kid, but never experienced the film until Elite Entertainment's 1998 DVD. No, I didn't care much for it then, and really my opinion hasn't changed too much. Though I have seen the film several times since and even with this viewing the positives shine ever bright--yet the negatives are ever more damning. There's a wonderful sense of self-awareness embedded in the proceedings. It's the not kind of (usually) annoying "winks" at knowledgeable viewers that garners groans nowadays. Lustig and company almost seemed to know the unbridled grimy nature of the day in New York City wasn't going to last forever. They understood the inherent menace in seedy motels, neon electric strip revues, quiet subways lined with uncaring concrete, and the pervasive blackness surrounding dim street lamps. This is one of the film's strongest aspects. Not only is a female-slashing maniac alluding authorities, but the city is a damn frightening place to begin with. Lustig's direction with voyeuristic immediacy illuminates this despondency brilliantly. Spinell is the film's second greatest asset as Frank Zito. Apparently Spinell was most proud of his role, despite small but impactful roles in several undisputed film classics. As he should, the man is an ugly tour-de-force of twisted momma-morose flopsweat. His self-written monologies and disorganized diatribes are simply outstanding. By the end, even without direct explaination, the viewer gains a just-as-fractured sense of his motivations as he solely through his own words and actions. This is all incredibly important since his mission is to carry the entire film. It's a foregone conclusion to say he succeeds well beyond expectations for such sordid material. Just think, arguably today's biggest male star, Will Smith, can't support a film alone if I Am Legend is any indication. It's a damn shame we never got to see a full-length feature Maniac 2: Mr. Robbie. Caroline Munro, built like a brick shithouse and having no business in this film. Here we have a solid forty-five minutes of Zito merciless stalk-and-slash and then suddenly we have him acting like a youthful gentlemen and scoring a dinner date with a Bond girl in record time. I know Lustig personally and rightfully omitted the dinner scene from his DVD director's cut, but all sequences featuring Munro are inconsequential. There's simply no way a worldly, ravishing photographer being smitten with an pot-marked gorilla of a man like Zito. I'm sorry, Spinell in reality probably could pull it off, but not Zito and certainly not with the established flow. This totally works against the Zito character and is flat out a huge blemish. Of course, to make it work extensive re-working would have had to be done. Without it, only an assemblege of kills sequences would have remained. I'm unsure what would have been best. The Media VHS, produced in 1981, isn't bad at all when taking its age into account. The picture looks nice and relatively bright without much damage aside from cigarette reel change burns. The sound is also pretty great for a non Hi-fi track, little if any hum with everything from the highest of screams to all the great ambience shining through clearly. Consider it a rite of passage, like it or not. Funnily enough, I love this film. For me, it just kinda feels like what an exploitation film SHOULD be, sleazy, and violent as hell. I saw it first around the same time as yourself, though I had to watch it on a bootleg of a Dutch video (subs and all), as it was still banned over in these waters. The same week I first watched this, I saw Nightmare in a Damaged Brain, and both are neck for neck with me as favorites of a time long gone. Sure, it has heavy flaws, but it's the raw ad nasty atmosphere that makes it an experience for me. 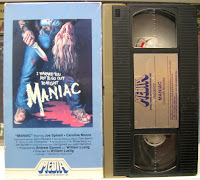 For New York grime, I will take this over New York Ripper any day, I am a big fan of Maniac but one cant rightfully disagree with you about the dinner sequences. I can see how they attempted to approach the character as a sociopath that put on a shining exterior when he was confronted with proper society, it is just an awkward turn for the film. Cant wait to see Last Horror Film though!! Great movie. I had rented this a long time ago and loved it. I bought the VHS (Anchor Bay?) back around '97 or '98. It had one of those covers that flipped open and it had scenes from the never finished Mr. Robbie (aka Maniac 2). Wish the Anchor Bay/Blue Underground dvd had that, but I read that the Troma re-release of Last Horror Film (originally released by them as Fanatic) will have the Mr. Robbie scenes. Anyway, great review. I agree that it is kind of silly that Caroline Munro's character would ever go on a date with Zito, but I still love the movie anyway.